Just as bulk tank milk urea nitrogen (MUN) helps monitor efficiency of nitrogen use in our herds, a new test for milk fatty acids might become a valuable tool for predicting potential feeding and management issues on your dairy. Researchers at Cornell University and Miner Institute are identifying correlations between milk fatty acids and milk fat and protein, but also with issues such as overcrowding, feeding frequency, ration fiber and fresh cow health. Herds that ship to St. Albans Cooperative in the Northeast are now receiving this bulk tank data along with fat, protein, lactose and MUNs. St. Albans will also be testing for unsaturated fatty acids, which can subsequently be used to determine the risk of butterfat depression. Milk fat contains individual fatty acids that are categorized as de novo (short chain fatty acids produced in the udder), mixed origin (16 carbon fatty acids synthesized in the udder and of feed origin) or preformed fatty acids, which come from mobilization of body fat as well as feed. The sum of these fatty acids will be roughly 94.5% of the fat test (the other 5% is the glycerol portion of the fat). In general, cows with higher de novo fatty acids have healthier rumen environments. De novo fatty acids are highly correlated with milk fat test. A Holstein herd, for example, with a fat test of 3.75% or more will have a mini- mum de novo fatty acid concentration of 0.85 grams (g) per 100 g of milk. De novo fatty acids are also positively correlated with milk protein test. High de novo herds tend to have lower stocking densi- ties. High stocking density leads to slug feeding, higher levels of trans fatty acids that cause milk fat depression and variable rumen pH. High de novo herds tend to be fed (or feed pushed up) more often. Rations with low physically effective fiber will reduce de novo fatty acids. When an ingredient change causes energy density of the ration to decrease, you can expect mixed origin fatty acids to decrease. If cows start losing body weight, preformed fatty acids will increase in the milk. Rations with rumen inert fat containing C16 and C18 fatty acids will most likely have higher baseline levels of mixed origin and preformed fatty acids in the milk. The number of double bonds per fatty acid is a measure of the unsaturated fatty acids in milk. The rumen unsaturated fatty acid load, or RUFAL, is a sum of the unsat- urated fatty acids in the ration. High unsaturated fatty acids in the milk indicate higher RUFAL and is associated with milk fat depression. 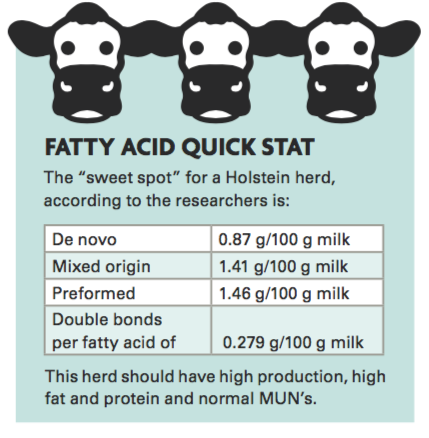 The “sweet spot” for a Holstein herd, according to the researchers, is de novo 0.87 g/100 g milk, mixed origin 1.41 g/100 g milk, preformed 1.46 g/100 g milk, and dou- ble bonds per fatty acid at .279. This herd should have high production, high fat and protein and normal MUN’s. Heather Dann, one of the Miner Institute researchers, is excited about other potential uses of this technology. She is looking at using it for milk predicted blood non-esterified fatty acids (NEFA) levels in fresh cows. She also sees it being incorporated into the milking parlor with cow-side milk sample tests on individual cows. I would encourage other milk processors and co-ops to investigate this technology and provide this informa- tion to their producers. Fatty acid analysis appears to be another great diagnostic tool to tweak rations and identify management issues as well as head off issues with variable milk composition.